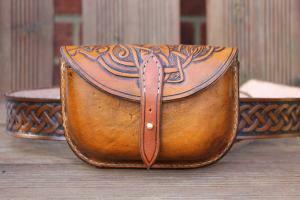 Leather belt pouch or Possibles Pouch. 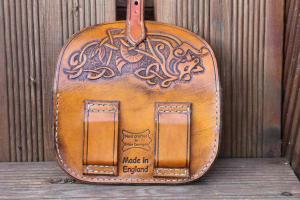 Handcrafted, moulded, hand carved and hand stitched. 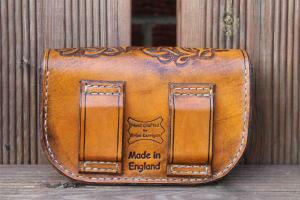 Vegetable tanned leather 2.5 -3mm thick. 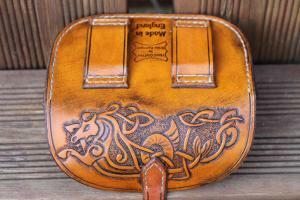 Carved with a Viking style Sea Horse knot pattern and finished in Antique Tan dye with a solid brass Sam Browne Stud. This hand made, moulded and hand stitched leather pouch sits comfortably on a belt up to 1.5" wide which fits through the two belt loops on the back. Also referred to as a Possibles Pouch by the Mountain Men of North America, it is ideal for carrying those day-to-day items which are too large for the pocket. Hi Brian,received pouch and it is just spot on.Great service great product.We need more of you out there.Best regards Nick. Hi Brian, Came home to my belt and pouch. Wow, great workmanship on both. Camera is due to arrive tomorrow, can't wait to try it. Thanks also for lining the pouch, and for the refund on postage.Glad I found your website. Great job, thank you very much Brian. Its great to know there are still a few things handmade in this age of the mass produced product with built-in obsolescence! Thank you very much for making and sending the pouch I ordered so quickly. The quality, value for money and finish are unsurpassable.